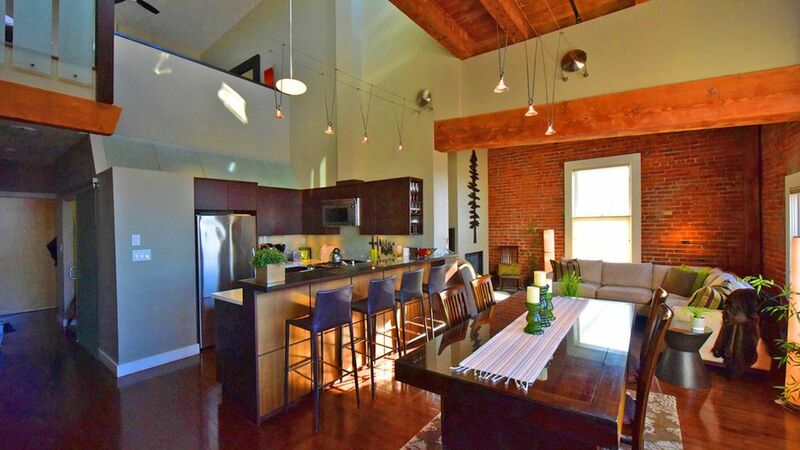 This stunning 2 Bedroom,2 bathroom Penthouse Loft is located on the west side of the building. This heritage rebuild is in the heart of Victoria's Old Town; a vibrant urban community and the hub for shopping, dining and entertainment. Beautifully custom designed to thoughtfully blend urban modern chic with original heritage features; fir beams, brick walls, soaring ceilings and great natural light. The high-end finishings include stainless appliances, exotic wood dining bar, gas fireplace, luxurious spa-like baths. No detail was left untouched on this one-of-a-kind property. The piece de résistance - a private 275 sq ft rooftop deck with city and mountain views and ocean glimpses – perfect for BBQ’s and relaxing. Starter supplies of paper products, bath soap, coffee, tea, spices, cooking oil, etc. The open Loft Bedroom has a platform bed with a high quality queen size mattress, luxurious sheets and a duvet. The loft bedroom also has built in cabinetry, lamps, ceiling fan and a full ensuite bathroom with a walk in shower. Downstairs bedroom has a high quality queen size bed and linens with side tables, lamps and a ceiling fan. There is a sliding frosted glass door for privacy. The main floor full sized bathroom is equipped with high end cabinetry, tub and shower and is located downstairs,adjacent to the second bedroom. The kitchen is fully equipped with everything you need with quality european stainless steel appliances, beautiful wood eating bar and stools. The large open dining room has a beautiful wood table that can accommodate 6 people and the open concept living room with a large comfortable sectional and gas fireplace, is a great place to wind down in the evenings. The private open 275 square foot rooftop deck is equipped with a natural gas bbq, propane heaters , a high top table and 4 chairs as well as furnished lounge area to relax in and enjoy the sunset. Dear Valued Guests, The Government has implemented two additional taxes on Short Term Vacations (under 27 days stay) in BC which takes effect October 1, 2018. These new taxes are as follows and will unfortunately be added to the total rental. The VRBO/HomeAway platform unfortunately does not yet have the means to separate the taxes to distinguish Short Term Rentals versus Long Term Stays so for long term bookings, the taxes will be ADDED and then the 11% (PST & MRDT taxes) that are not applicable will be refunded to you. This unit sleeps maximum 4 adults and unauthorized sleepover guests are not allowed. Absolutely no smoking in the suite or on the deck. Welcome to Victoria! We are proud to call this beautiful, vibrant city our home.We've been managing vacation properties in Victoria for several years, and are very excited about offering this heritage loft ,on behalf of the owners, our good friends Les and Deb. Their goal is to make your stay with us a cherished memory. Both bathrooms have been customized for a spa like atmosphere. One secure underground parking spot located directly by the elevator room entrance. Beautiful and comfortable sectional couch, coffee table, lamps , TV and gas fireplace . Tea, coffee, spices, cooking oil etc. This place is perfect in every way. The location is unbeatable. Heather is so helpful and friendly and responds immediately to any questions you have. The apartment is immaculate, better equipped than most homes (definitely mine!). The hosts have thought of everything and more to make your stay comfortable and wonderful. We have thoroughly enjoyed it here and I would recommend this place to the most discerning traveller. We travel a lot, this is one of the best places we’ve stayed in. We are happy to hear that you enjoyed your stay with us! We really want our guests to feel at home here and I am glad that you did. We look forward to seeing you again sometime! Perfect location! Walking distance to everything downtown. This condo is stocked with all the amenities you need. Heather and Tim were great! A very high end property that has everything. Outstanding deck with high end Weber for all your barbecues . A great find in Victoria. We are glad you enjoyed your stay and the features of the condo. We hope you will consider staying with us again sometime. BEAUTIFUL home! Very cozy, inviting, and clean. This was our first visit to Victoria, BC. This condo is located right in the middle of downtown and just about anything is walking distance. Heather was very resourceful, touring the home for us on the day we arrived and giving us a few pointers on what to do since we were first-timers. We have had issues renting out vacation getaways (cleanliness), but this one was definitely a great place to stay! Don't hesitate to book a trip here! We are so glad you enjoyed your stay in the condo and in our beautiful City! We look forward to hopefully hosting you again sometime. Very comfortable condominium. Lovely kitchen and easy to use. Great location close to many wonderful restaurants. We were there on a work matter and not on a holiday so we didn’t get to enjoy the patio. But the patio was large and well situated. We are glad you found the condo comfortable. We hope you will be able to come back and enjoy it again! Our weeks stay was superb in this luxurious apartment. Everything is finished to a very high standard and to be honest it would be very hard to find a fault unless you are being very picky. The kitchen is well stocked in every way right down to plastic glasses outside and glass for inside. The balcony with great views, quality BBQ, seating and heating is to die for. To top it off it’s location is great, you can walk to bars, restaurants and shops. It was a pleasure to host you and your family! We hope to see you all again! As long time residents of downtown Victoria, we are excited to welcome guests to the city.We live our life as "tourists in our own town", frequenting local cuisine, walking the gorgeous streets,neighbourhoods ,and beaches.Activities abound with many local festivals, markets, cultural events, museums,and historic tours.When its time to get away from the bustle of the quaint city, we take long strolls on Dallas Road, a short walk from downtown.